This week (1 – 7 August, 2016) is Finnsnes i Fest, our ‘city’ festival with food, music, activities and the fun fair. A short and fun, family oriented concert in the ‘knowledge park’ (library) foyer. 11.20 am might seem like a strange time, but it’s designed so that visitors travelling on the coastal ‘steamer’, the Hurtigruten, can join the audience. 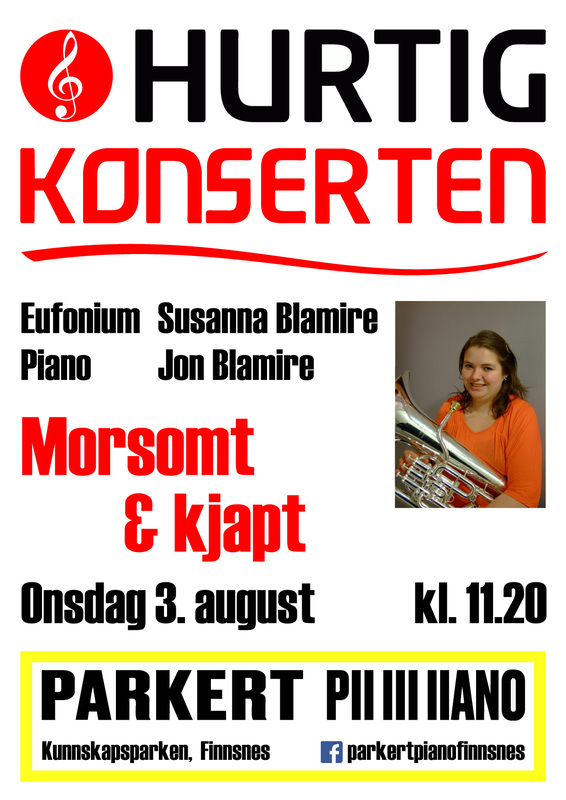 Susanna has already played one such concert this summer, which is part of a series organised by the culture school on their Parkert Piano (parked piano). Parkert Pianos have been placed in a variety of public spaces around Norway and are available for anyone to play. Perhaps the one which has drawn most attention is in the departure lounge at Oslo airport. If you’re in the area, pop in, get some knowledge, then grab a coffee / something to eat in the foyer cafe, and listen to the concert. Very civilised!